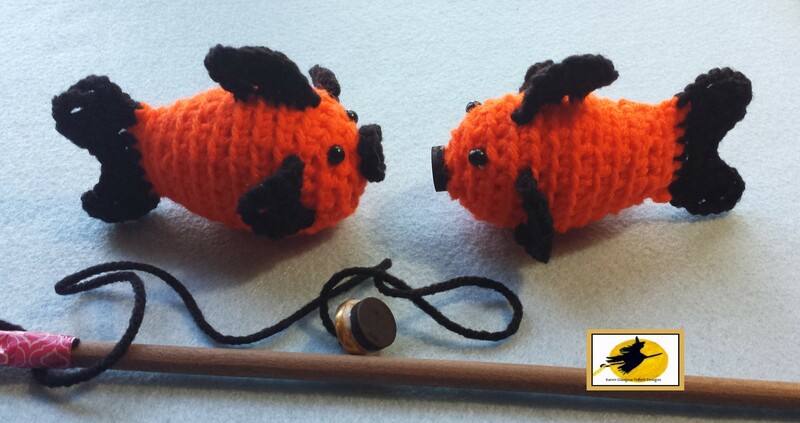 Crochet Amigurumi Fish Pattern- Catch Me If You Can! 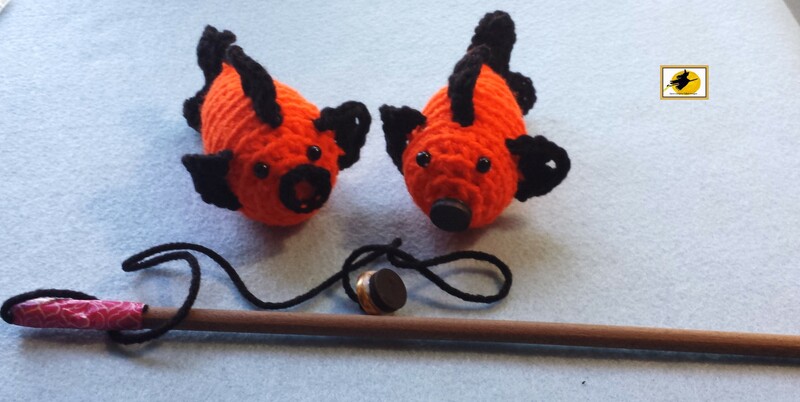 Several years ago, my sister and I received a fun fishing game for Christmas. This was during the mid part of the 1960s – prior to much attention being placed on the safety of children and their games. This particular game had magnetized fish that “swam” along an electrified board. Each fish had a metal loop for a mouth and each fishing pole had a metal hook at the end of a long wire. Regardless of the significant electrical shocks that we received, we did have a good time playing this game. A few weeks ago, I saw a post on a social media site that showed a homemade version of this game. Plush fish were used. Each fish had a magnetic mouth and each pole had a magnet attached to the line to attract and “catch” each fish. I couldn’t find a pattern associated with this new hand created version. After searching several sites that did provide sewing, crochet and knitting patterns of various fish, and not finding a fish style that suited my aesthetics, I decided to create my own pattern. This pattern was created to make this fishing game for my granddaughter. Of course, the usual disclaimers would be in place. This pattern uses magnets, poking devices and small parts, so the finished product is not be suitable for animals, small children and some adults who tend to put things in their mouths. Unless directed, do not join rounds. 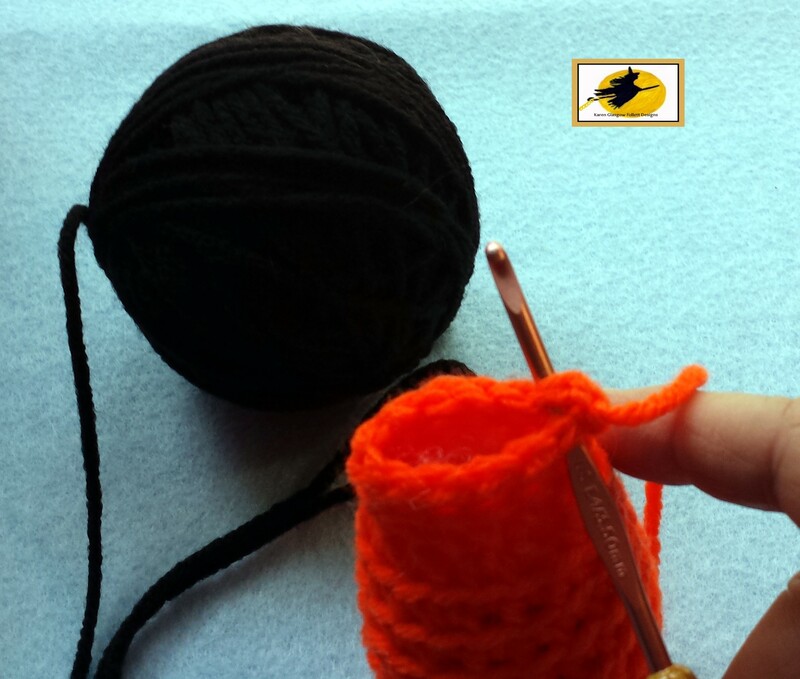 You may want to place a stitch marker (safety pin, ect) into the first stitch of each round to keep your place. Unless directed, each stitch of the fish body is worked in the back loop only (this is the top of the stitch loop that is furthest away from you) You will be later attaching fins to some of the unused loops and the remaining unused loops give a “scale” quality to your fish. At the end of round 14, cut and secure yarn. Turn fish body inside out, so the unused loops are showing on the outside of the fish body. Stuff fish as desired with fiber fill. With yarn designated for dorsal fin, *insert hook into first unused loop, yarn over, and draw back through, Insert hook into unused loop of adjacent stitch, yarn over and draw back through loop, Yarn over and draw back trough all loops on hook. * Ch 1, Repeat from * to * in the unused loops of round 7, ch 2, Repeat from * to * round 8. Ch 4, Work 2 dc in the same stitch worked in round 8’s unused loops, Work dc in next ch 1 space, Work hdc in the next stitch worked in round 7’s unused loops, Work a sc in the next ch 1 space, Work a sl st in the stitch worked in round 6’s unused loops. If desired, work another sl st around the post of the round 6 sc directly in front of the dorsal fin. Cut and secure yarn. You will work one side with the fish face facing you and the other side with the tail facing you. Again, locating the unused loops of round 6, count down 6 loops from the dorsal fin. With fin color yarn, insert hook into that unused loop and attach yarn with a sl st. ch 1, and sc into the same loop, Working toward the dorsal fin, work 2 dc, ch3, 2 dc in the next unused loop, sc, ch1 and sl st in the next unused loop. Cut and secure yarn. Repeat this sequence on the opposite side of the fish for the other fin. If you are wanting plush fish and no magnet, you can create lips for your fish. Locate the unused loops of the 1st round, Insert hook into one of the loops and attach yarn with a sl st. *Work ch 1 and sl st in the next loop* Repeat from * to * around. Ch 1, and join to beginning sl st. Cut and secure yarn. With tapestry needle (or other large eye needle) bury all yarn ends into the fiber fill. 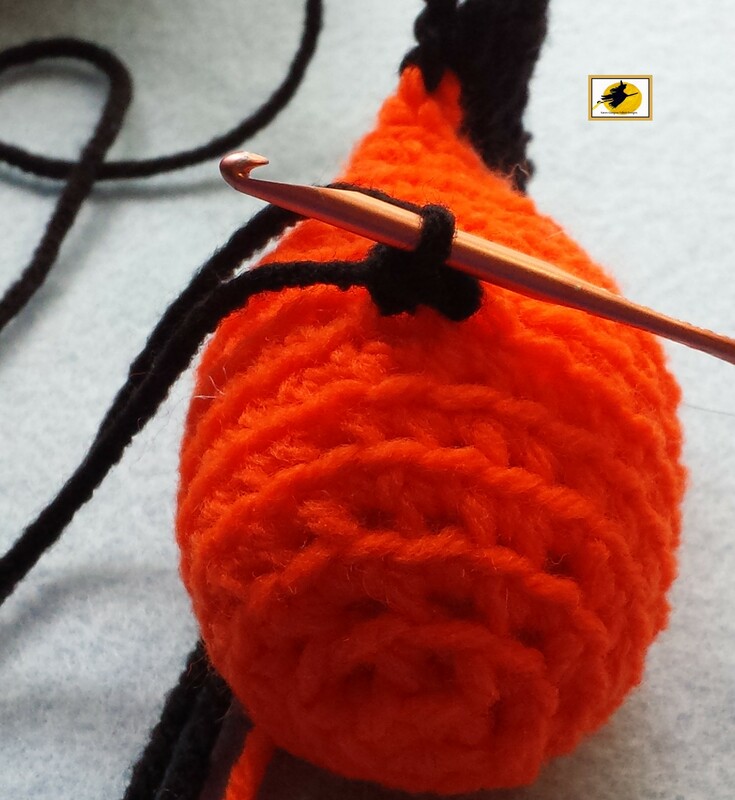 Attach beads to create the fish eyes, bury the thread ends in the fiber fill. Make sure that you are using the attracting sides of the magnets. Glue one magnet to fish face. Glue the other magnet to the shank button. Allow both ample drying time. 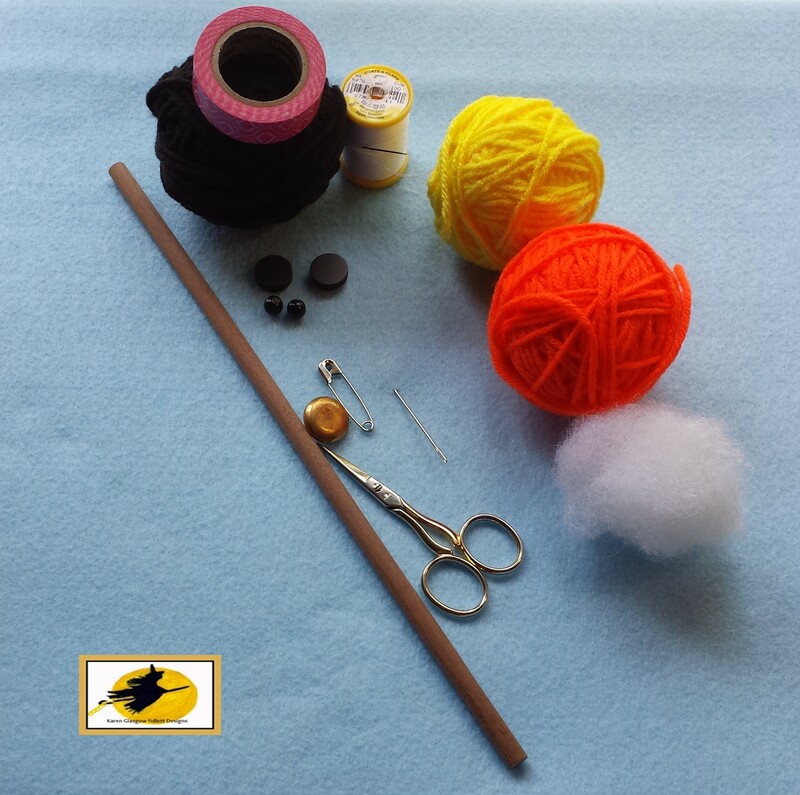 Attach yarn or other “line” to pole and secure with tape. Thread other end through the shank of the button. Now you are set for a fun fishing experience!